I have a vague recollection of grasshopper desserts from my youth. Pies, usually, with chocolate crusts. They were pale green and minty, and the grownups seemed to like them because they had crème de menthe in them, which gave them a little bit of a kick. This Grasshopper Dessert bears little resemblance to those, apart from the hue. The base is lime Jell-O – yes, this is another one of those lime-mint blends. 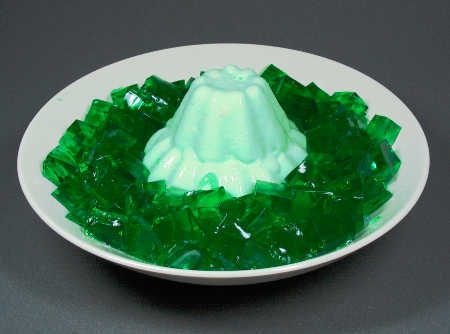 However, since this is a “centerpiece dessert,” it contains two packets (six ounces) of Jell-O, and for some reason the amount of crème de menthe is the same as in the one-packet Quick Crème de Menthe Frappé. While two tablespoonsful of crème de menthe stands out in two cups of lime Jell-O, in four cups it seems to blend in rather nicely. 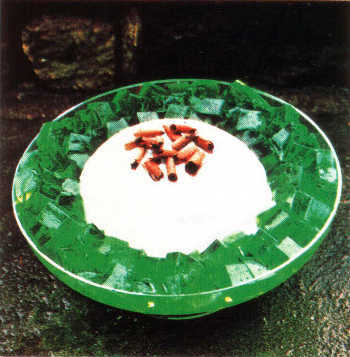 The light green tower in the middle of the dish is part of the Jell-O mixed into two cups of prepared Dream Whip. I have to say I was underwhelmed by the Dream Whip. I don’t really understand the concept. You add milk and vanilla extract to a packet of powder and whip it up with an electric mixer. It’s no easier, or more convenient, than whipping real cream. It’s not dairy-free, nonfat, or anything like that – so what’s the point? Worse, the stuff tastes like vanilla frosting out of a can. Cool Whip is actually less nasty. On the plus side, I finally got a chance to use the technique for Cubed Gelatin again. (That was sarcasm, in case you missed it.) I did really like the color of this, the dark, rich green cubes glittering around the sides with the creamy green at the center. You have to give Jell-O credit, when you do it right it’s definitely pleasing to the eye. Overall, this one was really okay, though I have to add a nasty for the Dream Whip. This recipe does make a fairly large quantity of Jell-O, and I was wondering how we were going to eat it all. Then on Tuesday night there was a little dinnertime meltdown, and I ended up eating all the leftovers for supper. I can now report that it is, in fact, possible to get full from eating Jell-O. 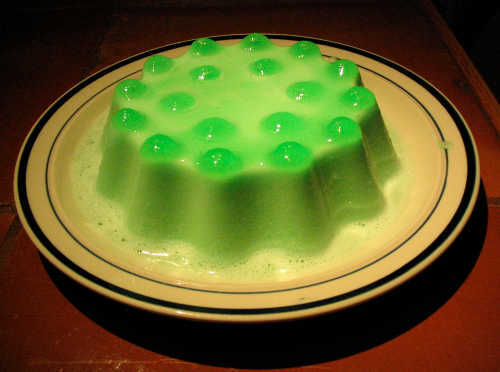 Also, (and I mention this only because I know you’re wondering,) if you eat enough lime Jell-O, you will poop green. It’s Pi Day once again, and Mother Nature conveniently sent a blizzard to give me the day off from work, so I made you a pie! I only have a couple of pie recipes left in the Project, so instead of using one of those, I found a recipe for this 1970s holiday favorite, Grasshopper Pie. We have two cookbooks that include recipes for this. One is a volume of the Time Life The Good Cook series that Bryan rescued from his mother’s house; that version of the recipe is more “from scratch” and includes gelatin and superfine sugar. The other, my trusty old Betty Crocker cookbook, simplifies things a bit by melting down “jet-puffed” marshmallows. Of course, I used the Betty Crocker recipe. The pie is named after a minty cocktail that was popular in the mid-twentieth century, and ingredient-wise it’s pretty similar. The base of the pie is marshmallow and unsweetened whipped cream, and it’s flavored with crème de menthe and white crème de cacao. In a chocolate cookie crumb crust, it tastes like mint chocolate chip ice cream, and I can see why I liked it as a kid. (It’s not bad now either, maybe just a tad too sweet…) The grownups pretended to make a big deal of the fact that it had liqueur in it, but this pie has less of a kick to it than, say, Almond Joy Creme Pie. Besides the excuse to make a pie, I wanted to do a Pi Day post in support of science. It seems a little crazy to even have to say that, but in this era of “alternative facts” I guess it’s become important to stand up for real facts, and for the process to go about finding them, which is all that science is. I’ve been mulling over how to approach this topic, and what keeps catching my attention is the growing skepticism (fueled by our president and his administration) towards experts, conflating them with some notion of “the elite”. I get it, kind of. I grew up working class, and I’m well familiar with that streak of insecurity that says, “What makes those eggheads think they’re better than me?” It’s only gotten worse as we’ve latched onto the notion that a college education is the only pathway out of a life of burger-flipping and other jobs that “aren’t a career”. When I was growing up, it was perfectly respectable to go into a trade if one wasn’t academically inclined; now, it seems, any way of making a living that doesn’t require a college degree is looked down upon, and that’s just not right. But we’re not going to win back respect for all kinds of honest work by devaluing work that requires more education. Yes, in a way, science is the province of an “elite”, insofar as pursuing a career in science requires many years of education, as well as a deep curiosity, and the discipline and doggedness to learn and assimilate concepts that are genuinely challenging – and the humility to make lots of mistakes and learn from them. It’s elite in the same way that, for example, being an auto mechanic is elite – not everyone has the interest or temperament to work with the systems that make a car run, and learning to do that work requires years of learning, and curiosity and patience. I grew up around gearheads, and they tend to be passionate about cars in much the same way that scientists are passionate about their work. I respect the hell out of both. They’re not mutually exclusive. Modern society is complex, and we need our scientists as much as we need our mechanics, and our plumbers, carpenters, sanitation workers, food service workers, and administrative assistants. Some mysterious gravitational force drew me to MIT even though I’m not, strictly speaking, a math/science type of person, and I feel as though I’ve found my tribe there. I support scientists, both in the course of making a living and in principle, because I appreciate and respect what they’re doing. I understand that the years of learning and training that they’ve done make them trustworthy as experts in their chosen fields. I understand that when 97% of scientists agree on a particular conclusion, we should probably listen to them. I’m looking forward to the March for Science next month. Hopefully the weather will be a little better than today…. Don’t worry, you’ll forget this image as soon as you click off the page. Okay, I’ll be honest with you. I don’t really remember this one, and the notes I took are scant. It’s one of those simple recipes from the first chapter of the book, where you’re supposed to be just getting the hang of Jell-O, but reading the recipe is one of those “what the hell” moments. It’s lime Jell-O flavored with with crème de menthe, of all things, whipped up in a blender to give it that frothy look. Unsurprisingly, I determined that the combination of lime Jell-O and mint is better without the addition of pineapple, although the aftertaste was still not pleasant. It started out vaguely refreshing, and gradually turned into a sort of burning on the tongue. Nevertheless, I gave it two nasties. Doing this as a Memory Lane post feels like a bit of a cheat, but it doesn’t seem like something worth repeating. Besides, as I’m pushing fifty, I’m starting to appreciate that life is just too short to spent extra time making and eating mint-enhanced lime Jell-O. That said, turning forty-eight last month gave me an idea. I’ve been following a blog called Fit is a Feminist Issue that was started by two Canadian philosophy professors who, as they were approaching fifty, decided that they were going to make a goal of being their fittest ever by their fiftieth birthdays (which were last summer/fall) and blog about it along the way. Since they did the fitness thing, I’m thinking that I will make my fiftieth birthday the outside limit for getting through The New Joys of Jell-O. That way, no matter what, in January 2017 I’ll have something to celebrate.